Modern workplaces typically consist of more than upholstered furnishings and carpeted floors. In fact, tile and other hard surfaces are becoming increasingly commonplace. The Bestway Carpet & Tile Cleaning process extracts the dirt from your tile floors, removing it from deep within the pores of the grout. In almost no time, we clean, restore and protect your tired-looking tiles, eliminating the expense that comes with total replacement. First, we inspect your floors to determine the best treatment process. Then our trained technicians use a proprietary high-pressure rotary tool with dual rotating jets to clean your tile and grout. We combine this tool with the same truck-mounted steam/pressure cleaning that we use to deep clean your carpet. Then we apply specific cleaners that strip away any waxy buildup and extract the dirt from deep within the tile and pores of your grout. It’s no secret that traffic can be heavy at certain times of the day and on special occasions. Spills and stains appear quickly, transforming your tile floors from beautiful to ugly. 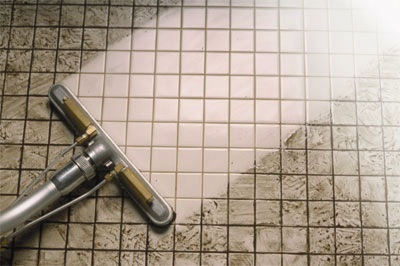 Our trained commercial tile & grout cleaning technicians use state-of-the-art equipment to create a high-pressure water and vacuum combination that suctions the dirt from deep within the tile and grout. The entire process takes about 30 to 60 minutes for an average-size room, but businesses with large tiled areas should allow for additional time. This, too, can vary based on several factors, including the size of the tile, amount of soil in the grout lines, and room configuration. Just like carpet, dirt builds up over time dulling your tile’s appearance and discoloring your grout. A thorough, professional tile & grout cleaning is the only way to remove the deep-down dirt so contact Bestway Carpet & Tile Cleaning your number 1 commercial tile & grout cleaning service in Eatontown NJ.